The trade villages of Draj are host to the myriad rumors that are spawned from the endless waste that lies North of the Tyr region. An interesting yarn came to my attention during yet another fruitless investigation. Since this tale of an enraged fire elemental hunting caravans mercilessly was marginally more reasonable than the other wild lirr-chase I was on (of course, both of them were marginally less likely to be real than my chances of ascendancy to Overlord of Athas), I, in my infinite boredom, looked into it. Less the Powers-That-Be take offence at my apparent flippancy, take a moment to observe that of all my inquiries less than one in ten bear fruit, and of these, the vast majority are in some way inaccessible (usually through potent psionic and magical defenses) that they might as well be the products of a broy-dulled mind. Whining aside, the preparation for my trip into the wastes Northwest of the bandit states was relatively simple, thanks in a large part to our order's network of moles, spies, and other assets. I assumed my alter ego of Pterak Snag-Tooth, a poor merchant and even worse gambler, and assembled a small team of drunkards whose primary mission was to supposedly protect me. Wondering how real merchants ever trust their guards, I gathered my trade goods, silks and other portable items, on the backs of three Inixes, and set off to the north, away from Draj. The first real test of Pterak's crew of would-be rogues, the Barrier Wastes, was as disastrous as I had feared. In the first night less than half of my "bodyguards" fled into the wastes probably only to meet an even worse fate (or so I hope). The mutinous thug who talked of murdering his all too naive employer after another late night of gambling awoke just in time to wonder why his lungs wouldn't inhale. And for the Inixes, I had to keep their bean-sized brains under tight watch less they went as mad as the rest of the world they live in. Once past the incessant wind of the Barrier Wastes (as a personal note, it is twenty times worse than any description could give), the burnt red stones of the north beckoned. My destination: Ss'meka (Glorious Scrap Finding in Ssurran), a launch-off point for most of the alleged victims. I noticed the predators in the north are a lot more brazen, which forced me to intervene directly several times. A personal favorite of mine was the look on one half-elven guard's face when a braxat fled from him as if he were the Dragon. Ss'meka is a typical Ssurran village - sprawling, cluttered and packed full of Ssurrans. 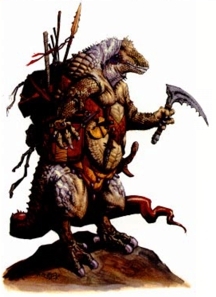 Ssurrans are like the Tari of the North, only they resemble bloated, scaly, bipedal toads. They are inadvertently offensive in almost every way, from their smell (an earthy ammonia) to their dull unblinking eyes. Their raiders are even worse. An elven raider will loot the dead, but a Ssurran raider will strip the dead of everything, even sandals and loincloths. Which they often turn around and try to sell as new. Needless to say Ssurrans rank petty low on my scale of intelligent life. As I was saying, Ss'meka is a wretched hole of a trading outpost, although the Ssurrans once regarded it as another Altaruk. I said "once" for even to the dullest Ssurran it was a dying trading post, mostly because there was no one to trade with the Ssurrans (The only foreign traders I saw during my stay was a pair of enigmatic Nikaals with their scowling mul bodyguard). Needless to say my sorry caravan was an instant hit, and the Ssurrans swarmed me like templars to a drunken noble. Even with Pterak's limited trading skills, I made a killing, achieving at least a twofold profit, although the majority of it was second-hand goods. I saw my surviving guards also barter or buy goods from these bloated, hissing traders which immediately caused me to lose what little respect they earned from me. That night, Pterak changed from merchant to rumormonger over a "friendly" game of King's Cards. As an aside, if I ever had to find something a Ssurran could do right, I can say with certainty is that they bluff with the best of them. Over the course of the night Pterak steadily lost monies as he pried loose the story of the mysterious raiders who preyed upon the caravans. As the Ssurrans slowly became inebriated (a very expensive endeavor) a picture emerged of a group of renegade fire clerics who struck out from a volcanic wasteland, burning all that fell to them. Most of the Ssurrans were trying to make up their minds as to either run away from, or try to buy off the raiders, but due to the decentralized nature of their settlements, a decision was slow in coming. Using my telepathy to win big in the last hand, I bid them a goodnight. The next morning I announced to my bodyguards that my next stop was Fastr'ka (“Near a Mine” in Ssurran). At which point my guards flatly refused, fearing the "Fire Demons" that the Ssurrans were so fearful of. A threefold raise in wages spurred their courage, however. The next several days saw most of my guards decide that life as a hermit was preferable to guarding a madman. I was about to turn around and give up on this fool's errand when the attack occurred. It was as swift as it was brutal. Fires ignited in the gullets of my inixes, roasting them from the inside. Meanwhile, my guards and I tried to dodge the most spectacular display of pyrotechnics I ever had the misfortune of experiencing. By the time the smoke cleared, it was obvious that the two surviving guards and I were surrounded by a motley collection of beings clothed in elaborate dress. We were summarily bound and were hauled to their camp, which was set near a dormant volcano. As we were transported, I came to the conclusion that I was at the mercy of madmen, to judge from their maniacal howls and their complete lack of anything approaching reason in their eyes. My men came to the same conclusion, for they soon fainted away. As we were dumped in a pit that was designated to hold prisoners, my captor, an elf whose face was coated with patches of blisters, informed me that the Son of Hasschentur would soon interrogate me and decide my fate. I replied that I earnestly hoped so, and was then lowered into the pit. I then noticed this pit looked like it had hosted several bonfires in its existence. Upon noticing the burnt bits of bone, my stalwart companions swooned again. I began to brood. I was interrupted most rudely when I was levitated out of the pit with the Way. I was escorted to a surprisingly humble tent where the Son of Hasschentur waited. The tent was dim, but I was aware of the presence of another being. Before my eyes could focus, my mind was invaded. Despite my initial surprise and fear, I was relieved that, although my assailant was powerful, he was mortal, a fallible mortal. I let him access my mind, subtly steering him away from the recesses to more mundane aspects. I could tell he was at once pleased, intrigued, and apprehensive. By now I could see him, a haggard human dressed in finery that was not his, a robber baron of emaciated proportions. His plain face bespoke of no obvious insanity, but his very presence screamed that something was wrong. He began a conversation with me, proudly declaring I was member of the Order. When I did not deny this, he seemed to become even more intense. The following hours would see a most unusual verbal parrying as the cleric (which I was sure this character was) and I attempted to maneuver the other into giving the first clue of their intentions. I was like an elven knife fighter against a half-giant, desperately meeting each veiled question, each innuendo, each probing theory with parries and ripostes whose conviction came from a desperate need to know, as well as long hours perusing our order's extensive literature collection (I always admired the Five Arguments of Ysselgar myself). As I tried to keep my erstwhile host at arm's length, I attempted to probe his mental strength for the fight that was sure to come. He was most assuredly on guard, but there was a plurality to his defenses, as if two forces were shaping his outermost defenses. It was like trying to find a smooth spot on a mekillot, but I believed I had found a crack, a nexus of sorts, with which I could apply mental leverage to throw both defenses wide open. Meanwhile, in this contest of the irresistible force versus the immovable object, the object won. My host stood up, demanding to know the secrets to elemental transformation, his pallid features molding themselves into a contorted mask of primal rage. So abrupt was this change of attitude I was taken aback quite literally and fell back with my chair. As I crashed to the ground, my mental plane was changing to a vast inferno. With singed flesh on my nostrils I launched my attack against the nexus with the speed of a windblown wildfire and the fury of the Cerulean Storm. When my eyes opened, I saw my host rolling on the floor cradling his head as he bawled like a child. Immediately, I enhanced my senses and became aware of the half or so dozen guards rushing to my location. I then destroyed the pathetic wretch at my feet, a fitting punishment for the disruption he had caused utilizing the Way. As the first spells were hurled at me, I teleported out blind . . . Sometime later, I made it back to Ss'meka, singed and battered. I ignored the loathsome Ssurran peddlers who came to me hoping for an easy mark. I instead sought out the Nikaals, and upon finding out they were leaving upon the morrow, I joined them for the trek home. The civilized Ssurran of the north organize themselves along the lines of "great" merchant houses, crudely aping the actions of the dynastic houses to the South. The organizations are at best loose, ill-defined affairs, with traditions, rules, and customs that change as the situation warrant them (most of the time to please a potential customer). Their agents are many, although they display an appalling lack of professionalism; they more than make up for it in the shoddiness of their goods. Their scrounging is not as bad as Niklas implied, most of the time. Their society places no taboos on taking items from a corpse, which results in them being consummate battlefield scavengers. (the Ssurran have a lot of pragmatic traditions such as this). As for their taste in the finer things of life, well, some races are less aesthetic than others. Their ability to trade is the subject of much derision amongst the elven tribes of the Scorched Plateau. In fact, the elves often allow the Ssurran better deals than they would to others, complaining that it is no sport in cheating them because of their ineptness. Almost all Ssurran show a tendency for poor trading, accepting profit margins that would cause a member of the dynastic merchant houses to be stripped of rank, dyed blue, and then be sold to an obsidian mine. The Ssurran trade towns are a polyglot conglomeration of huts, tents, wagons, yurts, and other assorted structures that show no indication of a central plan at all. As in the Tyr region, one merchant house will dominate, but cooperation between various houses occurs more frequently and in better faith. See the Ssurran Extended Writeup by Kamelion for more about the ssurran race. Born with the name of Gilam, he was a sixth generation shaman to a primitive tribe of Hunter/Gatherers of the Scorched Plateau. His father died young, thrusting the youth into the role his birth decreed. Gilam served his post admirably, leading his tribe to a spiritual oneness with Fire, his patron element. As his youthfulness began to fade, he sensed that there was a next step in the path of communion with his element, and that he needed to learn the Way to do so. Regrettably, the tribal psionicist was unable to teach Gilam, so the cleric left his tribe, the first gnawing of obsession working away at him. For two years he wandered, seeking many teachers. Although their styles, languages, and ability differed; the message was the same: Gilam lacked some key element that would've allowed him to become a practitioner of the Way. Bereft of Hope, he began the life of a wanderer, secretly hoping his life would be put to a quick end. During his sojourn, he came upon the monolithic ruins of a Green Age castle. Taking shelter for the night, Gilam was surprised to hear a mind-voice promising to fulfill his greatest desire. Fearing he was going insane, but too desirous of his long dreamt communion with his element, Gilam searched for the speaker. The speaker was a brilliant Topaz, who claimed to have been a wanderer whose psyche was unjustly trapped as punishment long ago. It claimed to be a psionicist of middling power and that it knew of long forgotten ways to instruct people in the use of psionics. Gilam leapt at the chance. There was a flash, then blinding agony. Then, like a sudden blaze, the Will and the Way formed the Nexus, and life finally seemed to be getting back on track. During his long trip home, the jewel, called Verek, continued to tutor Gilam on his new abilities. Gilam began to gradually change on the journey. His mind, slowly being re-forged by Verek, began to take a darker slant on life. In lieu of his protector role, he became a persecutor, preying on those weaker than him. On a dark night, an entity calling itself Hasschentur, an elemental lord of destruction and mayhem, became Gilam's patron. Fueled by his new patron's bloodlust and Verek's whispered demands for release, Gilam left a trail of burnt corpses and senseless carnage. The night of his homecoming started a week- long frenzy of "cleansing" the impure members of his former tribe. In the end, only two remained, fanatical disciples of the Son of Hasschentur. They fled into the wilderness, waylaying anything they could capture, and indoctrinating the survivors into their cult. Gilam's training continued, although Verek's lessons left him incapacitated for days at a time. As his followers grew to a score in number, Gilam sensed that his time for the long awaited communion was here. His band settled into a narrow cleft and awaited their leader's ascension to the furnace of Hasschentur. Unfortunately, Gilam was continually thwarted by Hasschentur's irregular ways. The entity was not so willing to lose his best mortal agent nor did he believe Gilam's mastery of psionics was complete, and released the requirements for the ritual in drips and dabs. Enraged by this callous treatment, the cleric would lead his followers on wild rampages, which inadvertently made Hasschentur more unwilling to help his ascendancy. Verekarn Murhsson was an anomaly of the Green Age. In this era hope and plenty, Verekarn was a specter of things to come. He was a murderer, his talent of the Way perverted by a need he never understood. Eventually, he was brought down by the authorities. His punishment was to have his psyche impressed into a gem so that his psionic talents could be harnessed to benefit society, a common fate in those days. Verek's stone survived the fall of his captors, and with time he could exercise his will ever more freely. All he needed was a body, and he could be free once again. A travel-worn cleric who chanced near his abode was a perfect opportunity. The cleric wished to master the Way, and Verek obliged. His method was brutal and physically punishing, destroying instead of nurturing, and was to be the groundwork to possess Gilam's body. He also subtly aided the cleric, enhancing his abilities without his host's knowledge. Gilam began to be molded into Verek's mold, and his adoption of Hasschentur provided a most welcome release in the form of his impulsive and reckless rages. Unfortunately, the cleric reached an impasse with his master, and showed little interest in Verek's teachings. Their bond was snapped by the agent of the Order who confronted Gilam, causing the cleric's mental defenses, which were shored up by Verek, to crumble. Verek's current whereabouts are unknown, although it is likely that one of Gilam's acolytes would've taken the stone as a relic of his former master.